An birus amo an gagmay nga mga nakakatapon nga ahente nga damo la ha sulod han usa ka selula. Collier, Leslie; Balows, Albert; Sussman, Max (1998) Topley and Wilson's Microbiology and Microbial Infections ninth edition, Volume 1, Virology, volume editors: Mahy, Brian and Collier, Leslie. Arnold. ISBN 0-340-66316-2. Dimmock, N.J; Easton, Andrew J; Leppard, Keith (2007) Introduction to Modern Virology sixth edition, Blackwell Publishing, ISBN 1-4051-3645-6. Knipe, David M; Howley, Peter M; Griffin, Diane E; Lamb, Robert A; Martin, Malcolm A; Roizman, Bernard; Straus Stephen E. (2007) Fields Virology, Lippincott Williams & Wilkins. ISBN 0-7817-6060-7. Shors, Teri (2008). 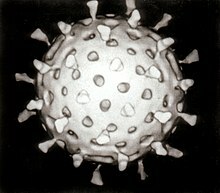 Understanding Viruses. Jones and Bartlett Publishers. ISBN 0-7637-2932-9. David Baltimore online Seminar: "Introduction to Viruses and HIV"
Ari Helenius online seminar: "Virus entry"
Ini nga pakli kataposan nga ginliwat dida han 23:58, 18 Enero 2015.